A Royal Navy Petty Officer who murdered two young men has won a three-year reduction in his minimum jail term. Allan Grimson, then aged 42, was jailed for life in 2001 for killing Nicholas Wright, 18, from Leicester, and Sion Jenkins, 20, from Newbury, Berks. Grimson, of London Road, Portsmouth, was told he must serve 22 years but that was increased later that year to 25 years by the then Home Secretary. The High Court ruled that 22 years was "eminently justified". At his trial at Winchester Crown Court, Grimson admitted the killings. 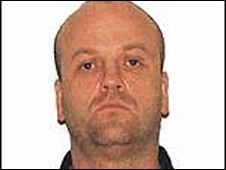 Judge Peter Cresswell described him as a "serial killer in nature if not by number". The bodies of Grimson's two victims were discovered four miles apart at the side of country lanes north of Winchester, Hampshire, in December 1999. Both murders had involved sexual abuse. It had been argued on Grimson's behalf that an appropriate minimum term, taking into account time spent in jail awaiting sentence, was 16 years, 262 days. At the High Court Mr Justice Plender said the murders "were exceptionally serious, even when compared to other murders involving sexual or sadistic conduct". Grimson, who has a personality disorder, was entitled to a reduction in the minimum term to reflect the time that he spent on remand.